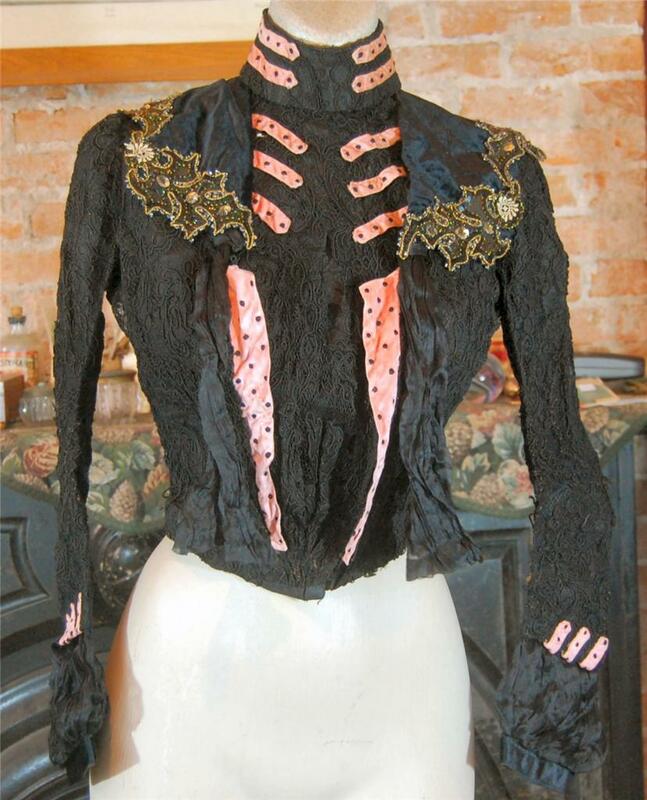 A beautiful Victorian ladies jacket made of cord embroidered lace over black silk on the front, back and sleeves. 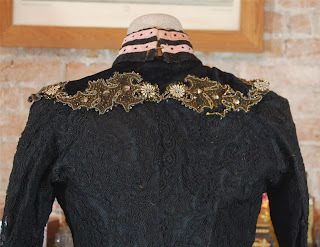 There is also pink velvet, with black embroidered spots, on the collar, sleeves and a front panel. There is also bead embroidered trim on the collar. A thin ribbon of silk hangs from each side of the front panel. The inside is signed Mrs. E. Radford, Cleveland, Ohio. The jacket does not fit my dress form so it should look more like the first pic on the front. I do not smell cigarette smoke on the fabric, but it does have that musty attic smell. There are holes in the silk on the front left which hides behind the panel. There is also a small tear on edge of the collar. The inside has a rip in one panel which can be repaired with backing tape. Although I see no dirt, it could use a cleaning. The fabric is very delicate but is still wearable, used for display, re-enactment or a theater play. Sleeve inseam with lace 19"
Length (back of collar to bottom) 20"
So, other than the ridiculous notion of wearing a silk bodice from the 1900's in a theater play - uh, no- , I did want to point out that I love pink and black together.